To Adopt or To Shop? For the most part, I have been assuming that your heart is set on acquiring a puppy. That’s understandable. Most people want to get a puppy because puppies are cute, they are clean slates and we dream about raising a dog to perfection from puppyhood. First-time dog owners, especially, can think of nothing else but that cute puppy that they will soon call their very own. Fewer are those that will purposefully look for an adult dog to buy, to adopt or to rehome. Attempt to complete the tasks I’ve listed down towards the end of this article. Where do shelter dogs come from? First, let’s find out why dogs end up in shelters and why there are so many stray dogs on the streets. In the Philippines, the primary reason that dogs end up in shelters is because of uncontrolled mating and reproduction of domestic dogs. Accidental or unplanned litters of puppies of owned dogs as well as litters of stray dogs results in hundreds of dogs ending up without a home every year. Our local shelter volunteers and other citizens concerned for animal welfare work hard to rescue many of these strays off the streets where it is unsafe for them, and where they can also contribute to public health problems by spreading diseases such as rabies, leptospirosis and other diseases transmissible from dogs to humans. But despite their efforts, hundreds more are the dogs that roam freely on the streets. They have no human family to go home to, and no assurance of shelter nor food. They are constantly at risk of being run over by vehicles or of succumbing to starvation or disease. Many are subjected to abuse from cruel humans that have no regard for animal life. Aside from the strays, shelters also rescue dogs from neglectful and abusive owners who do harm to animals because of their ignorance stemming from a lack of education or a general inability to provide adequate care. For the dogs that do end up in shelters, there is hope to find a forever home. However, because of the high number of dogs filling shelter kennels, and because shelter resources are limited, there is a need to find homes for dogs quickly to make room for other animals coming in. This is where you as a prospective dog owner, with your ability and willingness to provide a home to an animal, can be helpful. Do shelter dogs make good pets? Certainly. My own dog Tramp is a shelter dog that I adopted when he was close to a year old. I was told he was one of several pups of an unwanted litter that was abandoned in a dumpster. He gets along great with my other dog Ollie and he is also friendly to my adopted cats. Tramp isn’t perfect, as many of my students who have met him know, he has quite a temper around energetic young dogs and is specifically reactive to other dogs being walked on leash. But he is far from truly aggressive and mostly just makes a lot of noise. Although I have to be mindful of his reactivity, it is still a very small downside compared to how wonderful of a dog he is – easily trained, very loving and sweet. In fact, he stars in many of my videos that I shoot for my training classes, and he occasionally accompanies me to training sessions where he does some demos for the students. On top of all that, Tramp loves to cuddle! I’m glad I found him and made the decision to adopt him and I would not trade him for any puppy in the world. I hope you can see from Tramp’s example that adopting merits at least some consideration. 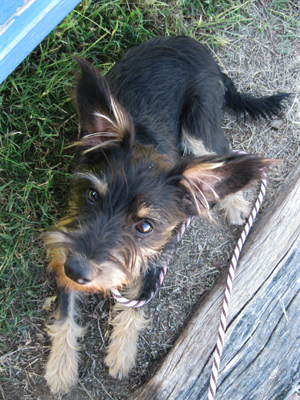 If you’re worried that a shelter dog might, like Tramp, come with behavioral issues, don’t be. Rescuers and shelter staff do their best to evaluate their rescues to see if they are fit to join a family, and to rehabilitate them or match them with experienced dog owners if they need special care. Shelter dogs and rescues are not second-rate pets. They can be as good a companion animal, and sometimes even better than a puppy you buy from a breeder. In fact, I can think of several examples wherein an adult shelter dog may meet your companion dog requirements more so than if you were to get a puppy. If you’ve been considering getting a puppy of a certain breed, it’s probably because you want to know exactly what your dog is going to look like. But what better way to be assured of your dog’s physical appearance than by getting him or her when he or she is already full grown? There aren’t going to be any surprises left. No changes in coat color, no guessing at the height and build, plus your dog is going to be very unique to all the other dogs that are out there. No one will have a dog just like yours, especially if you are adopting an Aspin (a Philippine Native Dog) or a mixed breed dog. You’ll know straight away if your dog is long-coated or short-coated, floppy-eared or with ears erect. Aside from being able to determine the physical appearance of your dog, you’ll also – with the help of shelter staff – be able to tell if your dog is energetic or laid back, if he/she prefers brisk, long walks or if he/she will be satisfied with a casual stroll around the block. Many shelters, because they want to be sure their charges are going to homes and families that are a perfect fit for them, will allow a sort of trial period to see if you and a certain shelter dog are going to be well-suited to each other. You can either visit them a few times at the shelter before making a final decision to adopt them, or you can foster them for a few weeks and see how that works out. The great thing about this set up is that in some way even the dog has a say in whether or not he or she feels comfortable going home with you. Another reason why you would want to “try out” a dog first is because you or a family member may have allergies. The cause of allergies can be very specific, and if you’ve been breaking into sneezing fits around certain dogs it’s not necessarily because you’re allergic to all dogs. You might just be allergic to a certain few. If so, there’s no need to deny yourself the joy of dog ownership. Foster a shelter dog and see if you develop any reactions, if not, it must mean you and that rescue were made for each other! Fostering is also something to consider if you already have resident pets. For instance, some adult dogs will have little patience for a bouncy little puppy, but pick the right rescue that complements your resident dog’s personality and they might effortlessly and instantly bond for life. Ask your local shelter what options they have for you for how you can meet and interact with the animals in their care. 3. You don’t have the time and energy to take care of and train a puppy. Mature, adult dogs – provided that they don’t already have medical or behavioral issues – won’t be as time-consuming and as expensive to take care of as young puppies. Most of the naughty chewing, nipping, and other playful yet destructive habits that little puppy monsters are known for will no longer be demonstrated by a mature adult dog. They’ll just be happy to quietly settle into your home. Some are even already potty trained! Senior shelter dogs, especially, should be considered if you are looking for a calm and quiet companion with whom to share leisurely strolls and restful evenings at home. 4. It’s less expensive to get a shelter dog than a purebred puppy. If money has been a constraint for you in getting a dog, consider adopting. This is NOT to say that the dog you will be adopting will cost less to care for. As I have said, shelter dogs, be they Aspins, mixes or purebreds, are not second-rate dogs, nor do they deserve second-rate care. When you adopt a dog from a shelter, you will still have to demonstrate your ability to adequately provide for your dog’s needs. However, the adoption fee required to acquire a shelter dog is much less expensive than the cost of buying a purebred puppy, and – depending on your shelter’s policies – your rescue will already be vaccinated, dewormed and spayed/neutered by the time they go home with you, saving you quite a considerable amount of money. Alright, so I had to sneak this one in there, a small attempt to guilt you into adopting. However, this is true: whenever you adopt a dog, you are potentially saving more than just one life – you are saving the life of the dog you adopted and that of the rescued stray that can now take your dog’s place and have his/her turn at finding a forever home. While I am unaware of any scientific studies supporting these observations, many are the anecdotes that tell of adopted shelter dogs demonstrating boundless devotion to their new families. I hope you give yourself a chance to be a recipient of that sort of immeasurable love and loyalty. What will I gain by buying a puppy? What will I lose if I choose to adopt an adult shelter dog rather than buy a puppy? What will it cost to adopt a dog? To buy a puppy? What am I looking for in a dog? Is it just companionship? Is there a shelter dog that might fit that description? Does the dog have to have specific traits for work or for a physical activity? Is there a shelter dog that might fit that description? 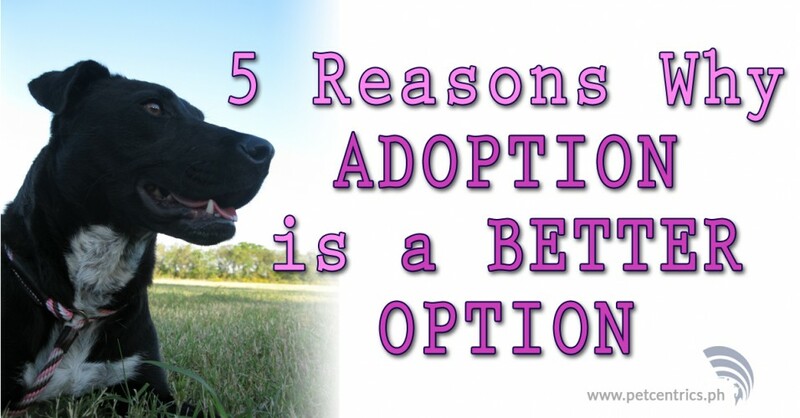 Why did you choose to adopt a dog? What do you like best about your adopted dog? What do you like least? Do you have any regrets about adopting your dog? Task #3: Visit your local shelter’s website and browse through their gallery of dogs for adoption OR visit the actual shelter and interact with some of the animals there. To help you with this task, below is a list of local shelters or rescue organizations (in the Philippines) that you can contact or visit. If you are aware of any other shelters or organizations that are not mentioned here, please post a comment below with a link to their site. Thank you for reading all the way to the end of this article. I hope you truly take the time to go through these tasks and consider adoption as an option for you, and I sincerely hope that yours will become a shelter dog’s forever home someday. 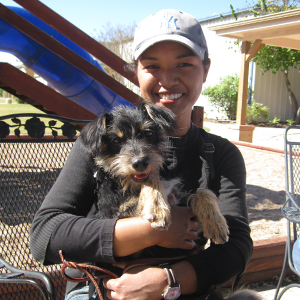 It is a truly enriching experience for the soul to adopt, love and care for a shelter animal. What a great article! I sincerely hope that many people here will read it. I do appreciate the links to some dog shelters / rescue organizations. I certainly will adopt an other dog. As mentioned in my above comment I was going to adopt an other rescued dog. I started this adoption process with PART, the Philippine Animal Rescue Team. I fulfilled their arduous requirements, got a visit appointment and traveled from Pangasinan to their shelter in San Jose del Monte in Bulacan province. We were expecting to speak with the competent and deciding person, but were informed that she was not present. So we ended up speaking with one not so informed employee, who could not answer all our questions . We looked at the dogs we liked based on the photos on their website and chose 2, later expanded this to 3 dogs. Right from the start the communication per email with PART was very difficult. Question were not answered and I managed to speak with the manager Mrs. Rowena Suzara by phone only once. During this phone call I was informed that suddenly 2 of our choices were put on ERLICHIA medication doxycycline antibiotic for 1 month. So we agreed to wait for 1 month until the end of this treatment to make sure that we would get healthy dogs and not infect our pack of 6 dogs ( all rescued / adopted dogs ). This is very surprising as the one senior dog Marsh we want to adopt has been in that shelter since 2012 and only now their vet from Manila discovered that she has Ehrlichia or has been exposed to it earlier. Neither Mrs. Suzara nor the shelter answer any questions by emails and for some mysterious reason since 2 weeks now they are not answering my phone calls or text messages either. The shelter mobile is switched off and the mobile of Mrs. Suzara rings but she does not pick it up. For some unknown reason to me they are now boycotting me like I have leprosy or something.I find these rude manners very disappointing and I keep on wondering why they are doing it. They do have a lady living in California USA – Mrs. Connie Langlois – who kindly answers some email questions but not all either. and have not been adopted even though many are really good looking dogs. Maybe they for some reason really do not want to get them adopted? Werner again. In the meantime this bad situation has luckily been cleared up and my adoption process is continuing. I am very about it. My prolonged adoption attempt with PART was a complete failure. It seems that they are not in the business of getting their dogs adopted at all, they just seem to be hoarding them for whatever purpose that may be. situation for all the nice dogs and cats spending the rest of their lives in the captivity of the stressful shelter ambience without love and dedication, eating lousy food and living in pretty unhygienic conditions due to alleged permanent lack of staff.